The holidays are upon us and that means lots of travel. This can overwhelmingly painful for many since the joy of packing is right up there with moving. The experience is just on a much smaller scale, but it still stings if you can’t get it right. Let’s take it step by step. Shall we begin with the suitcase? A compact, cute, rolling carry on is your best bet. Stay away from black when it comes to any suitcase. Let this Diane Von Furstenberg $90 piece pop against everybody else’s boring black. You will never lose your patterned, bright option again! 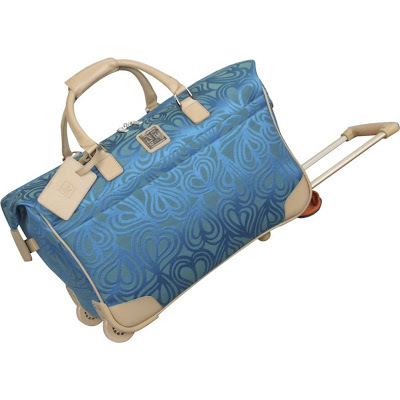 This duffel style is also slightly smaller then your average carry on, but is extremely expandable and has many pockets to store things separately. Since I am only allowing one suitcase per person, it is time to learn how to make the most of your small space. Roll it up. This method can easily double the amount that you get in your suitcase. It also saves you from wrinkled clothing!! Think about that, there are no folds so there are no creases when you take everything out. You will be able to stuff things in corners and spaces you never thought were useful. Do not waste any opportunity! Use your shoes to put socks and underwear in. Every space should be utilized. Just in case you do come across a wrinkle or two, owning a mini steamer/iron is necessary. For $30 you can instantly look like everything just came from the dry cleaners. If you don’t have time to pick one of these babies up, you can hang your wrinkled clothes in the bathroom with you when you shower. 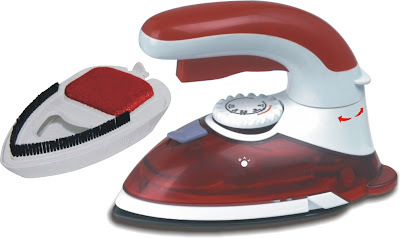 The steam helps to loosen up the creases, but nothing works like the portable steamer will….. The other quick items that you should keep on hand are a sewing kit, double sided tape and a tide stick. Each of these can be a life saver when a wardrobe malfunction hits. The sewing kit will tighten up that loose button, the double sided tape will fix a ripped hem or possible low cleavage situation and the tide stick will get out the gravy. Three items that will save the day. Now let’s talk clothing. What do you actually roll up in your cute suitcase? Packing for a trip is all about great foundation pieces with a few pop items. Accessories are your friend and will change up the look and feel of every piece you bring. Start simple, think basic. This is a great example, a black dress will be useful from day to evening. We are not after skin tight clothing, after all, this holiday is all about eating! Empire waist or silhouette skimming styles are your best options. Empire is fitted just below your bust leaving your tummy the chance to expand. Silhouette skimming styles are comfortable, do not look like a potato sack and still leave room for LOTS of turkey. Tights are a quick way to change up your black dress for different activities you may be attending. Bring a few pairs, you may not wear all of them, but these are reasonable options that can be stuffed into your suitcase anywhere. Choose patterns for extra funky and solids for simplicity. 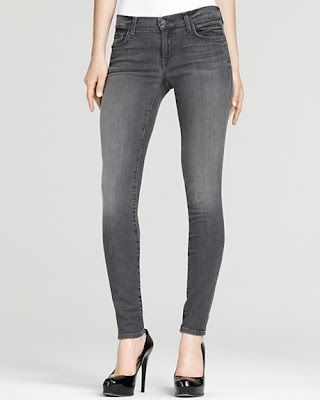 For even more casual days during your holiday, plan on having 1 pair of jeans. Yes, I said one. A basic skinny style is all you are going to need if you follow all of my packing rules. They should be darker in color so they can go from day to night, lots of versatility. The skinny style is easily tucked in the boots you will also be bringing. More on that later… In addition to your jeans, choose 2 sweaters, one thinner and one super cozy and thick. The thicker one will be what you travel in. You always want to wear your bulkier items during travel leaving more room for other clothing in your suitcase. The other choice for a bottom half is black leggings. This means that all of your layering pieces have to be slightly longer to cover your bum. If your leggings are thinner, add a pair of tights under them. You know you packed them! Megan Fox may look a bit sloppy, but she has her foundation pieces in order. Make sure to pack lots of different T shirts, tanks and long sleeve T’s. These are the perfect backdrop for everything else you have brought! Just like this picture and all before it, you better bring your best boots. You can bring up to 2 pairs. You are wearing one pair while you travel so you will pack the other one. People get crazy with shoes and keep throwing them in, but this is your worst enemy! They add weight and take up too much room. Aside from 2 pairs of boots, you may want to grab a pair of heels just for the dressier activities, but no more. Stop the shoe insanity! Last up to really complete your holiday packing is accessories. These are what is going to make every foundation piece you have brought really become an outfit. Do not think that I have told you to pack super boring items! I have told you to pack super simple items that can styled fabulously different!!! Here come tons of scarves, hats and jewelry. You can really stuff as much as you want into your suitcase so this is where you have options when you get there. You never know how you are going to feel each day and maybe you want to switch it up at the last second, let your accessories do the switching. 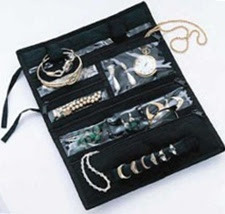 Buy a great traveling jewelry organizer that can be filled to the brim. Think everything. Necklaces, earrings, bracelets, rings…. Scarves are also fun and can be stuffed into your shoes right along with your underwear and socks. Have fun with this category! The finale to your holiday looks is going to be one fabulous medium sized neutral bag. This can mean anything to you! Pick a bag that is super versatile within your style and can be worn day to night. 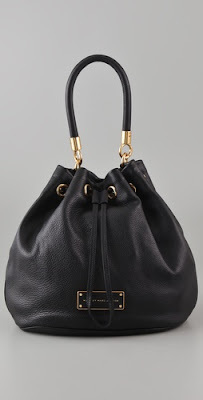 This Marc Jacobs bag is a perfect example of something that is sassy and realistic. It is your “one personal item”. You can stuff it to the brim on the way to your holiday, and they use it as a cute purse any where you go while you are there. It is expandable and yet flattens out just as easily when there is nothing in it. Wonderful. I think you should be ready to go now. Packing is just a nightmare until you buckle down and do it following the above rules. You need to stop worrying what you didn’t bring and focus on what you are going to bring. With the right basics, you can build any look through accessories. And always remember, unless you are in the middle of no where, there is a store just around the corner….. It is rare when you live somewhere that you take time out of your busy schedule to actually SEE your city. I live in one of the most culturally diverse towns on earth and I have only been to 2 museums in 6 years. Shameful. So when my friend Linda suggested we make our way uptown to pop into the Guggenheim, I was thrilled. Culture here I come. The museum is located on the upper east side. If you know anything about anything (or watch Gossip Girl), you know that the UES is full of high class fashion. I love to play a new fashion part everyday, so this was a great opportunity for me to go over the top. When I met Linda her first reaction was, “Why are you so fancy?” Because I can be Linda, because I can be. Do I need a better reason? Neither do you, dress up because you want to! I had no idea what I was walking into, which is kind of the way I like it. Surprises are fun. Apparently it was the first day of artist Maurizio Cattelan’s exhibit. It was seriously mind blowing. I am not a “museum” type of girl, but this was awesome. It is hard to tell from the picture what was going on, but let me do some quick explaining. Instead of hanging everything on the walls as Guggenheim exhibits are usually displayed, Cattelan said he would only show if everything was hung from the ceiling. As you circled up the winding ramp, every step gave you a different perspective and new pieces of art popped out at you. 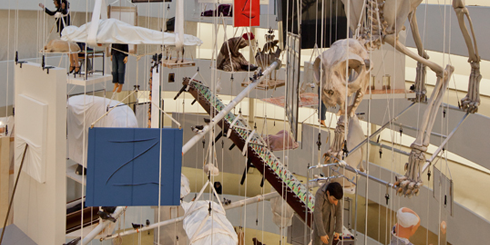 Cattelan had a fascination with mortality, so much of the art included actual dead animals, including several dead horses. Bizarre and totally cool. Completely worth the 18 bucks it cost to get in. Now that we have the art out of the way, let’s get back to the fashion:) It may be difficult to fully re-create my museum chic look because I always shop at sample sales, consignment stores and designer discount, but here is my best try. My gray coat was purchased several years ago at a fabulous sample sale store called Cadillac’s Castle in New York City. I don’t think I paid more then $100 bucks for it. 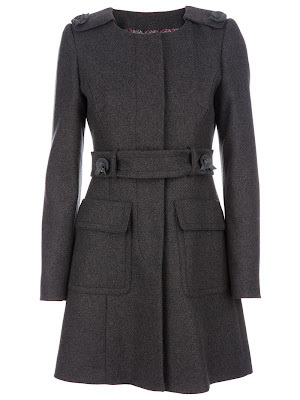 Unfortunately, this Walter by Walter Baker coat is no longer available…. Anywhere. So here is a much more expensive option by Valentino. Totally an investment so you have to take that into account when spending $1000 on a coat. The key is to have it cinch at the waist, slightly flaring until it ends just above your knees. It is a great shape for almost any body type. 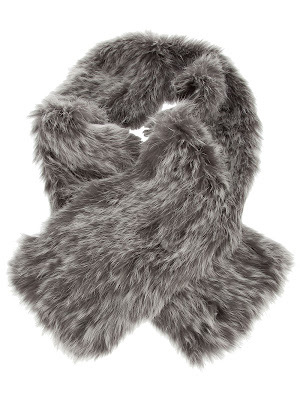 Next up, my awesome rabbit fur scarf by Adrienne Landau. Of course I purchased mine directly from the showroom during a sample sale, but it is not SO unoriginal that you can’t find a similar one. This option by Joseph is just over $100. The key to why I love my scarf so much is the slit in one side that allows you to put the other side through. You can pull it tight and keep yourself nice and warm or leave it loose for a stylish accessory. Rabbit is one of the least expensive furs and yet it looks super luxurious. Needless to say, this is the most affordable option. I actually did find my exact sunglasses. I love them and they were the least pricey pair I looked at! That never happens. By Vince Camuto, this is the first year that his shoe line has extended into accessories and clothing. He even has a few pop up stores here in NYC. His new line features fun, trendy pieces that are really not that expensive. 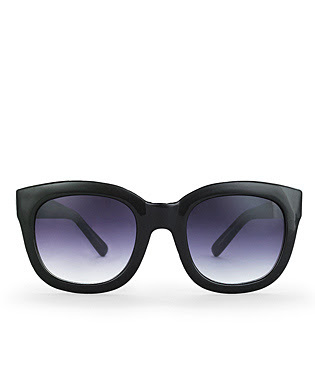 Take these big frame black sunglasses for example, they are only $55! That is great for a quality pair of sunnies. They are the perfect topper to any ensemble if you are going for the “rich and fabulous” look. We all need to be super fab every now and then…. And for the final piece…. 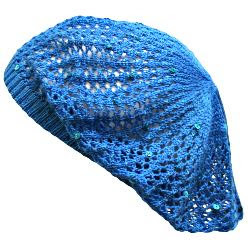 Unfortunately there is no way you can find my awesome hand knit beret because it actually is hand knit…. By my mommy! Often times we bring our creative talents together. I design something and she actually makes it. This fun beret is a great example. I love the color and it adds a touch of fun to any look. Additionally, it is a good weight so I can wear it inside and outside. Fashion for every temperature. This example is a little more blue, but provides the same amount of fun. At $15 from Sears, you really can’t beat it. So next time you have a reason to go a bit over the top, do it. Why not be the most fabulous person there? Why not wear all of those items that you would never put together? Have your friends ask you why you are so fancy and own it. You are fancy because you are fabulous and you can’t help it. If Serena loves gray, then it must be the new black. With colder months coming, we need more then just the normal neutrals. Black is so yesterday. Truth be told, I am never opposed to the simplicity of black or brown as your choice for a neutral, but try something new. Try gray. I am absolutely loving this look on Blake Lively for her character in Gossip Girl. It is gray, gray, gray and it looks good, good, good. I seriously cannot seem to stay away from it this fall. Every look I put together ends up so darn gray. So I am just going to go with it and consider it my signature of the season. And now it can be yours too…..
Another option that I absolutely love is doing a brown boot with gray tights. Reese has it spot on. It throws off the look from “normal” just the right amount. Tights are an important accessory during the colder months and can not only add excitement to your look, but they can extend the wearability of a lot of your pieces. Like dresses and skirts! Stop buying black everything all of the time. If you try one new thing this season, try gray tights. Not ready for a super leap yet? Gray jeans are a safe way to enter the world of “new neutrals”. Try out this pair by Seven. They are fantastic because they can go with black or brown. This makes a pair of gray jeans the most versatile you will ever own. If that isn’t a selling point, I don’t know what is! And finally, the perfect topper to any look? An indoor/outdoor gray jacket. This piece will be useful from fall all the way through to spring. It can be worn as your jacket when it is a bit warmer out or under your coat as a layering piece for your look. The gray color makes the jacket transferable from warmer to colder months. 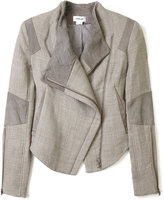 What a perfect investment piece this Helmut Lang jacket would make to any gal’s wardrobe. So I think my argument has been proven. Gray IS the new black beyond a reasonable doubt. Search just slightly outside your comfort zone and you will quickly find that adding some gray is just the sunshine your wardrobe needs.